The Australian Local Government Association (ALGA) wants state governments to invest in long-term recycling and sustainable waste solutions, rather than treating multi-million-dollar landfill levies as general revenue. Recycling has been put at risk by China’s plan to stop accepting shipments of some categories of contaminated waste. The National Waste and Recycling Industry Council says Australia may soon run out of space to store recycled waste. The Clean Energy Finance Corporation has set up a new $100 million equity fund for new projects to create bioenergy and energy from waste. 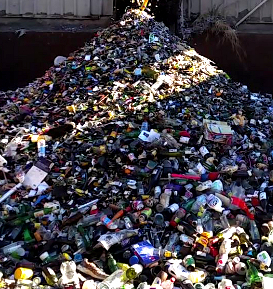 The Australian Council of Recycling and the Waste Management Association of Australia want state and federal governments to invest in rebooting the recycling industry and ensure more can be done locally without having to export waste. ALGA president David O’Loughlin said China’s decision means 30 per cent of Australia’s plastic recycling waste now has nowhere to go. He said he would raise the issue with the trade minister, Steve Ciobo. “We have trade arrangements with China and there are trade implications here that I think the Australian government should be mindful of,” Mr O’Loughlin said. Mr O’Loughlin said it would be worth considering whether Australia should continue accepting new plastics that were costly or difficult to recycle from China. He also accused New South Wales, Victoria and South Australia of raising hundreds of millions in recycling levies and not returning that money to councils. “In the absence of these levies being used to increase recycling in another way it’s just a tax on households,” he said. The recycling issue will be high on the agenda at an upcoming meeting of state and territory environment ministers.